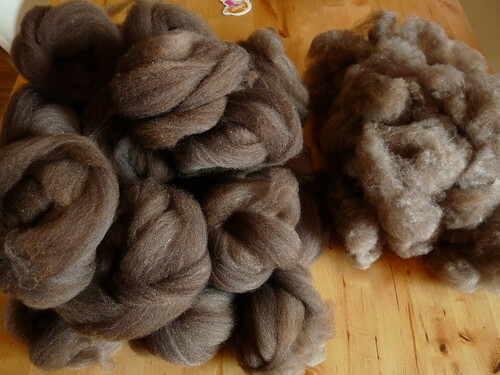 Have to admit, kind of pales when I already see others' finished yarns and full bobbins :) I do enjoy seeing the brown overtake the grey of the half-colored fleece, though it's a little less in different lights and makes me realize I was right... I have too few grey colored fleeces in the stash. Combing for the tour is going to be a good way for me not only to work on building up more muscle memory with the combs, but also to be able to track where I'm hitting re: waste fiber. Velveeta is a shortish stapled fleece, 3"... so I'll see more than if she were longer and less likely to get caught in the tines. She is also a lamb's fleece so I'm getting the lamb tips in with the waste as well, but 20% loss isn't too bad. I'd like to get it lower but I also admit I'm working more for speed than cleanliness with the deadline ahead. I am also still deciding on how much to comb prior to spinning. Yvonne only calls for a little under 1300 yards over 13 ounces, and I'm pretty sure I read Julie say that she didn't use all of the 3rd skein when knitting her sample. I don't mind combing, and part of me thinks I should just get it all done so I don't have to go back and stop to comb if I run out while spinning... but another just wants to get in front of the wheel right about now. Mmmm...that looks scrumptious. Yes it can certainly look a bit different when combed. Such a beautiful brown it turned out to be! Wow, that is such a gorgeous colour! sigh. 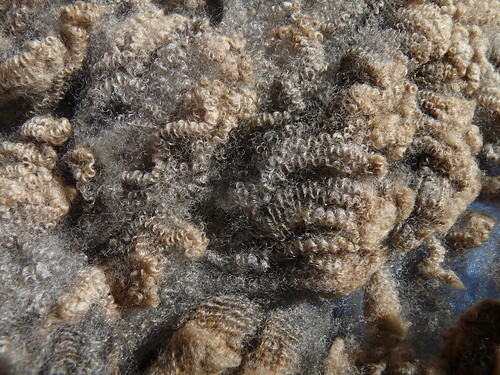 your photos of fleece are so beautiful. That will look SO GOOD on you! And the combing is beautiful.